This article is about the medical term. For the jazz composition, see Blood Count. CBC being performed in a hospital using an Abbott Cell-Dyn 1700 automatic analyzer. , this process is generally automated by use of an automated analyzer, with only approximately 10–20% of samples now being examined manually. Most blood counts today include a CBC count and leukocyte differential count (LDC) (that is, not just the total WBC count but also the count of each WBC type, such as neutrophils, eosinophils, basophils, monocytes, and lymphocytes). More sophisticated modern analyzers can provide extended differential counts, which include hematopoietic progenitor cells, immature granulocytes, and erythroblasts. Blood counting machines aspirate a very small amount of the specimen through narrow tubing followed by an aperture and a laser flow cell. Laser eye sensors count the number of cells passing through the aperture, and can identify them; this is flow cytometry. The two main sensors used are light detectors and electrical impedance. The instrument measures the type of blood cell by analyzing data about the size and aspects of light as they pass through the cells (called front and side scatter). 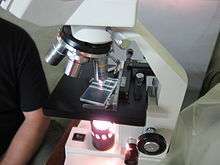 Other instruments measure different characteristics of the cells to categorize them. Neutrophils: May indicate bacterial infection. May also be raised in acute viral infections. Because of the segmented appearance of the nucleus, neutrophils are sometimes referred to as "segs". The nucleus of less mature neutrophils is not segmented, but has a band or rod-like shape. 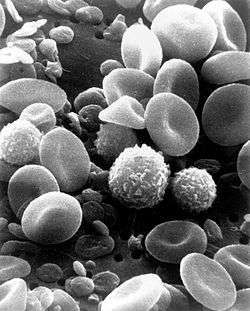 Less mature neutrophils—those that have recently been released from the bone marrow into the bloodstream—are known as "bands" or "stabs". Stab is a German term for rod. ↑ Verso, ML (May 1962). "The Evolution of Blood Counting Techniques" (PDF). Read at a meeting of the Section of the History of Medicine, First Australian Medical Congress. 8: 149–58. doi:10.1017/s0025727300029392. PMC 1033366 . PMID 14139094. Retrieved 9 September 2013. ↑ Mayo Clinic (14 February 2014). "Complete blood count (CBC) Why it's done – Tests and Procedures". mayoclinic.org. Retrieved 29 July 2014. Napolitano, LM; Kurek, S; Luchette, FA; Corwin, HL; Barie, PS; Tisherman, SA; Hebert, PC; Anderson, GL; Bard, MR; Bromberg, W; Chiu, WC; Cipolle, MD; Clancy, KD; Diebel, L; Hoff, WS; Hughes, KM; Munshi, I; Nayduch, D; Sandhu, R; Yelon, JA; American College of Critical Care Medicine of the Society of Critical Care, Medicine; Eastern Association for the Surgery of Trauma Practice Management, Workgroup (Dec 2009). "Clinical practice guideline: red blood cell transfusion in adult trauma and critical care.". Critical Care Medicine. 37 (12): 3124–57. doi:10.1097/CCM.0b013e3181b39f1b. PMID 19773646. ↑ Buttarello, M; Plebani, M (Jul 2008). 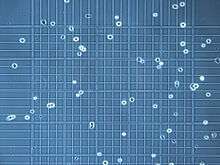 "Automated blood cell counts: state of the art.". American journal of clinical pathology. 130 (1): 104–16. doi:10.1309/EK3C7CTDKNVPXVTN. PMID 18550479. 1 2 3 4 5 6 7 David C., Dugdale (19 March 2012). "CBC: MedlinePlus Medical Encyclopedia". MedlinePlus. United States National Library of Medicine. Retrieved 29 July 2014. 1 2 3 4 "Complete Blood count with Differential". RbCeus.com. 2013. Retrieved 2014-11-21. ↑ "RBC indices". MedlinePlus: U.S. National Library of Medicine. Retrieved 1 June 2013.